Dubai; 10 February 2019: The 24th edition of the Dubai Shopping Festival (DSF) ends on a high note after 5 weeks of extensive promotions aimed at enriching shoppers experience and offering the deals that brought value to both residents and tourist alike. 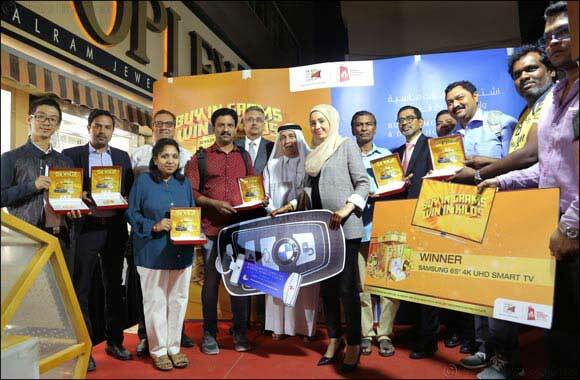 With 32 kg of gold, 5 luxurious BMW cars, several gold bars and Samsung smart TVs, Dubai Gold & Jewellery Group's (DGJG) promotions for gold & diamond shoppers were certainly the highlight of the shopping season. For the first time since its inception in 1996, the group designed two separate promotions for gold & diamond shoppers. With over 250 participating outlets, the 39 days promotion saw as many as 142 winners taking home valuable and memorable assets making it the biggest season for shoppers so far. As an initiative to offer something new and unique, the new introduced promotions as per the jewellery category boosted the interest of the shoppers and sales this year. Dubai Gold and jewellery industry is one of the very few industries that unite under one umbrella to offer such grand promotions consistently for the past 24 years. The group has given away a total of 950 kilograms of gold over the last 24 years, more than any other establishment in the world. Ahmed Al Khaja, CEO of Dubai Festivals and Retail Establishment (DFRE) added: “Our long-term partners, Dubai Gold & Jewellery Group (DGJG), have consistently offered incredible chances to win for residents and visitors to Dubai, enhancing the overall experience of Dubai Shopping Festival. This year was no different, with even greater promotions and prizes on offer, accelerating its life-changing prizes proposition. We are encouraged to hear reports of such strong sales and footfall and thank our partners for their continued efforts in making the raffles schedule one of the most exciting elements of the festival.